This topic contains 3 replies, has 2 voices, and was last updated by FontArk-editor 3 years, 12 months ago. How can i remove a combined letter ? When I try to remove a character combined with its U + code, there is an error message that appears. 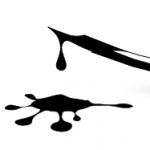 You don’t remove a glyph with it’s U+code. 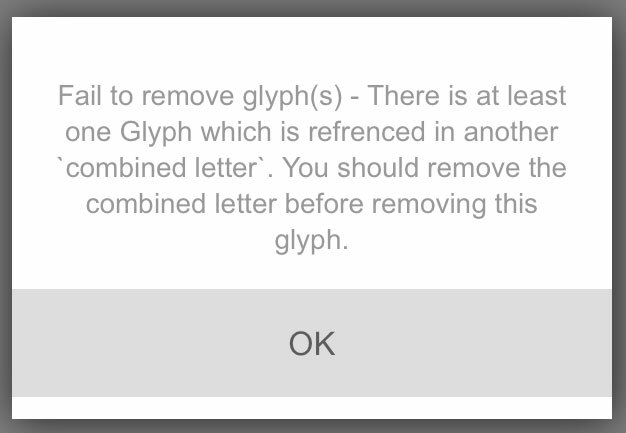 All you have to do to remove a glyph (combined or not) is to SELECT the glyph and click REMOVE. When a glyph is selected it has a pink background and you can see a pink warning on the top of the work area saying “1 glyph selected” (in case you like to delete only one glyph). make sure the right glyph to remove is selected than click REMOVE. This message should appear only when you try to delete a glyph that is a source to a combined letter, not a combined letter for itself. For example… the Capital A can’t be deleted because it is the source for all the accented As. The Grave (from the light green glyphs row) can’t be deleted because it is the source for all the “graved” combined letters etc’. So, either you don’t select the glyph for removal correctly, or there’s a hidden problem. To be sure you select the right glyph for removal please deselect all glyphs, then SELECT (not EDIT) only the glyph for removal, a pink background (not stroke!) should color the selected glyph, then click REMOVE. If this doesn’t delete the glyph please send me a personal message with your project name and the glyph you try to rmove and I’ll check it out.